Italian abbé; born near Montepulciano, Italy, April 26, 1789; died at Warsaw Feb. 28, 1832. He was appointed professor of history and Oriental languages at the University of Warsaw, Poland (1826). Chiarini was a prominent member of the so-called "Jewish Committee," consisting exclusively of Christian members, organized by imperial decree May 22, 1825. This committee established schools for Jewish boys and girls as well as classes of Hebrew for Christian young men to study Jewish history, rabbinical literature, and even Judæo-German, which would enable them to do organization (missionary) work among the Jews of Poland. Chiarini was entrusted by this body to translate the Babylonian Talmud, for which the Russian government granted him a subsidy of 12,000 thalers. He published his work, "Theéorie de Judaïsme Appliquée à la Réforme des Israélites do Tous les Pays do l'Europe, et Servant en Même Temps d'Ouvrage Préparatoire à la Version du Talmud de Babylone," 2 vols., Paris, 1830, as a precursor to the prescribed version of the Talmud which was to appear in six large folio volumes. Chiarini's book planned the reform of the Polish Jews, and also the general improvement of the condition of all Jews. This workis divided into three parts; in the first Chiarini states the difficulties of knowing the true character of Judaism; in the second he elucidates the theory of Judaism; and in the third the author treats of the reform of Judaism and discusses the means of removing its "pernicious" elements. In brief, Chiarini endeavors to prove that the so-called evils of Judaism originate chiefly from the alleged harmful antisocial teachings of the Talmud. He argues that the state should assist the Jews in freeing themselves from the influence of the Talmud, and that they should return to the simple Mosaic faith. This goal can be attained in two ways: first, by the establishment of schools where Bible instruction is given and the Hebrew grammar studied; and, secondly, by a French translation of the Babylonian Talmud, with explanatory notes and refutations. Chiarini recognized that the popular knowledge of the Jews and Judaism was inadequate and defective, and that their enemies furnish nothing but distorted instead of correct information. Nevertheless, his work is pervaded with some of the traditional prejudices against which he protests; but, at the same time, he expresses a sincere concern for the spiritual and material welfare of the Jews, and a desire to improve their condition. 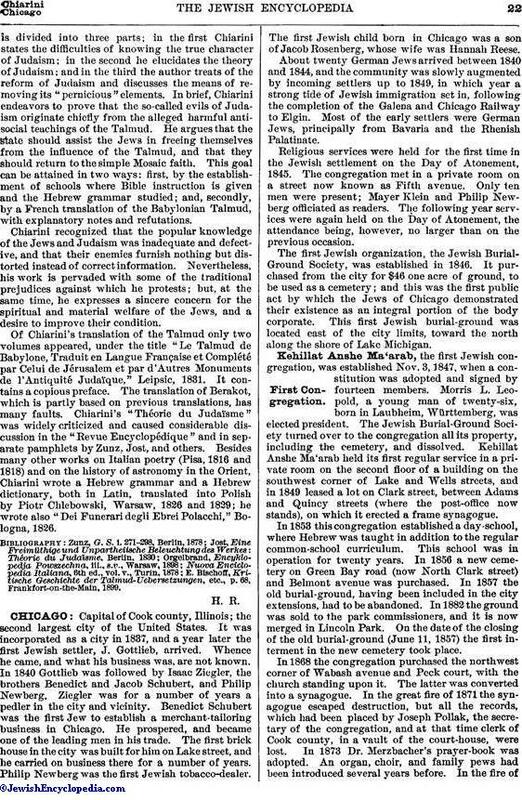 Of Chiarini's translation of the Talmud only two volumes appeared, under the title "Le Talmud de Babylone, Traduit en Langue Française et Complété par Celui de Jérusalem et par d'Autres Monuments de l'Antiquité Judaïque," Leipsic, 1831. It contains a copious preface. The translation of Berakot, which is partly based on previous translations, has many faults. Chiarini's "Théorie du Judaïsme" was widely criticized and caused considerable discussion in the "Revue Encyclopédique" and in separate pamphlets by Zunz, Josi, and others. 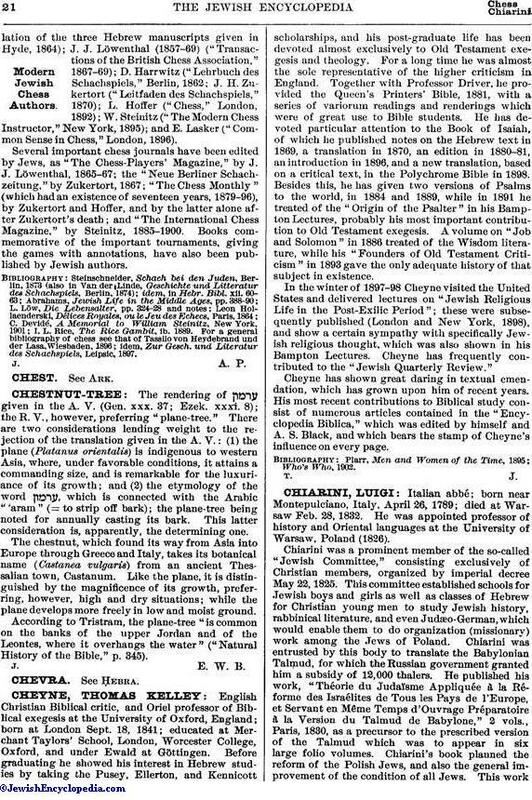 Besides many other works on Italian poetry (Pisa, 1816 and 1818) and on the history of astronomy in the Orient, Chiarini wrote a Hebrew grammar and a Hebrew dictionary, both in Latin, translated into Polish by Piotr Chlebowski, Warsaw, 1826 and 1829; he wrote also "Dei Funerari degli Ebrei Polacchi," Bologna, 1826. E. Bischoff, Kritische Geschichite der Talnmud-Uebersetzungen, etc., p. 68, Frankfort-on-the-Main, 1899.